Just landing on a dirt runway that had just been cleared from herds hanging' below in Kenya's Masai Mara was momentous enough, not to mention a five-day adventure roaming sun-soaked plains, getting up close and personal with lions and watching hundreds of wildebeest and zebra race across the Mara river. 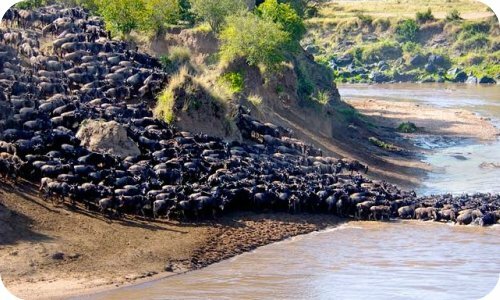 Visiting in the fall is bliss; it's just before rainy season and during the great migration when thousands of animals journey up from the Serengeti. Here's a taste of my million-times-better-than-a-zoo experience in the Masai Mara. Off-roading in a Land Rover (or like vehicle) on the uneven ground can be a semi-rough ride. An old lady I met brought a pillow with her to lessen the impact on her behind! Also, I get motion sick on any moving thing including chair lifts, yet didn't get sick despite the bumps. There's a reason why safari-wear is khaki: it's dusty and the light colour is good at warding off the mid-day heat. Bring warm clothes, it can be chilly in the early morning or late afternoon when there's no sun. Bring a good camera, we only brought a point-and-shoot Sony digi cam and I wish we could rewind and go back with a better camera. All lodges offer similar game drive packages, make sure you go on an all-day game drive---a highlight in terms of seeing more territory and animals.